During the 11th, 12th and 13th centuries, the civil and military constructions such as palaces and fortifications took on major importance. There are few remains that are conserved if we compare them with religious types of works, for this reason much of the knowledge that we have today about the architecture and art from the Romanesque period is related to churches, as well as cathedral and monastic ensembles. To understand the sense of the majority of the Romanesque works, it should be taken into account that the building is the framework for the rest of the production. The interior space adapts to the liturgical needs of each centre, and is therefore hierarchical. One of the most relevant points is the altar and its surroundings, the presbytery, where the essential act of the mass is held: the Eucharist. The most usual form of the altar is the mensa or table, with a covering that can be either towels or painted panels or carvings, or can be covered with precious metals such as gold or silver. Most of the objects or works are destined for this space (baldachins, altar frontispieces, images, etc.). All in all, the apse, which presides over the presbytery and the altar, is usually the place in the church in which the most important pictorial representation is located, with a theophany or representation of divinity in the centre. The church of Santa Maria de Taüll is the most complete example that is conserved of the pictorial decoration of a Romanesque interior. You can find on the vault of the apse the Epiphany or the adoration of the Kings, with the Mother of God as a throne for the child Jesus. This ensemble is completed with scenes from the Final Trial and other biblical stories on the walls, as well as on the columns and the separating arches of the naves. The stylistic differences highlight the hand of two masters, the one who painted the apse and the author of the Final Trial. The inside of a Romanesque building was much more sumptuous than can be imagined from today’s remains. It is necessary to include the objects intended for worship, from images to the sacred goblets used around the altar. In these cases, the production was very varied in terms of materials and techniques, but it is worth highlighting the workshops of the gold- and silversmiths specialised in work in gold, silver and enamel. On the outside of the buildings there is sculptural and pictorial decoration in the most notable points which are around the doors and cloisters, and also in the liturgical furniture or that used for funeral purposes. A paradigmatic example of sculptural decoration can be found on the monumental portal of Santa Maria de Ripoll. Despites its internationalisation, Romanesque art presents a great variety of stylistic movements that depend on the moment and the area, and also the cultural and artistic background of the promoters and the artists. In general, in the figurative arts, the shapes tended to be distorted compared with the natural shapes, towards a dependence on geometric patterns, abstraction and a certain rigidity. But solutions could also be provided, based on a certain expressiveness and dynamism, or of others inspired by the art of antiquity. Another characteristic of Romanesque is the vivacity of the colours. The density of the cleanly defined folds and contours in bodies without any reference to the third dimension. Around the year 1200, however, art underwent a strong renovation, as for example the moulding of the bodies, with more volume, a treatment more similar to the movement and gestures, and of more expressive faces. Regarding sculpture, the sense of moulding was recuperated, that searched for contrasts of light and shadow in the stone. The contribution of antiquity is especially visible in some ensembles inspired by ancient Roman sarcophaguses (this contribution is especially significant in the celebrated work of Mestre de Cabestany), and also in the Corinthian type capitols. 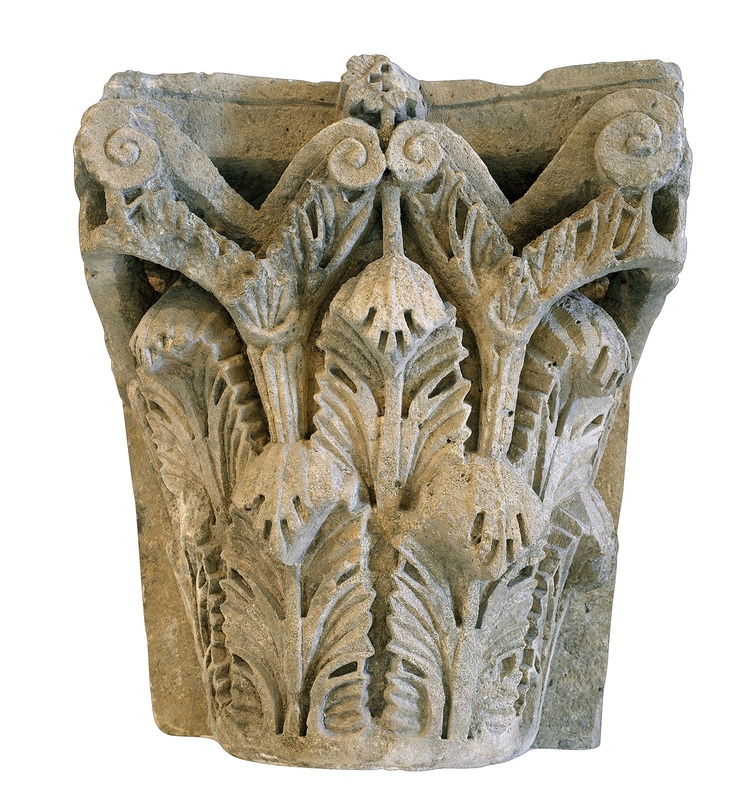 It can be seen in this way in the capitols of Besalú, with a scheme based on two or three rows of acanthus leaves and in the vaults developed in angles. Alongside this attention to vegetable themes, figurative representations were also developed, as can be seen in the pillars of Sant Miquel de Camarasa. 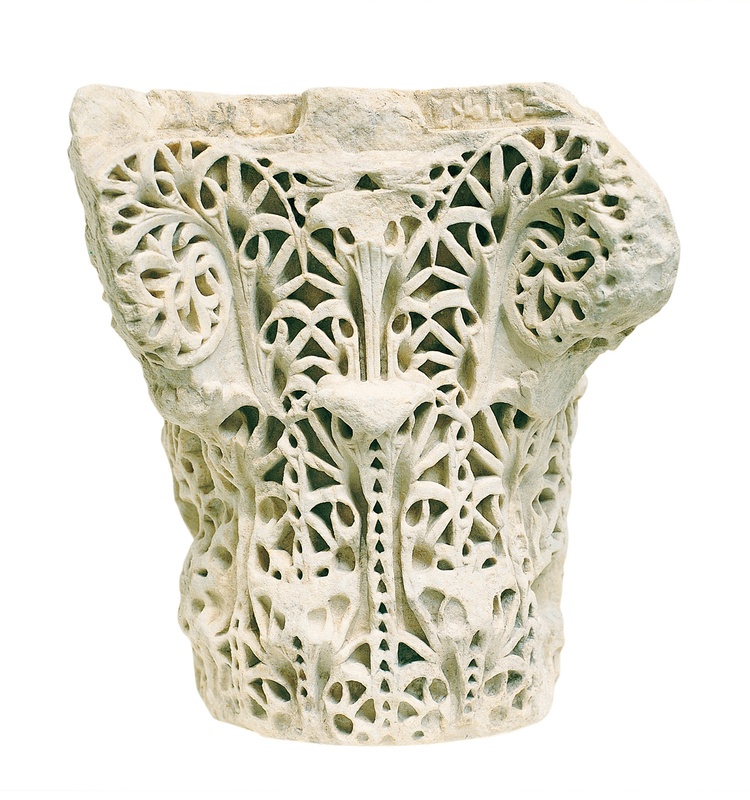 Romanesque art responds to a specific historic context, marked by the favourable conditions that were produced from the middle of the 10th century onwards, when Western Europe gradually recuperated itself after a period of instability. This resulted in improvements in agricultural techniques, in a demographic increase, in the revitalisation of commerce, and in improved communications. It was the period of feudalism, based on a very hierarchical social structure. The Church participated in this structure, from the outset as a defender of spiritual values. From the papacy in Rome a profound reform was undertaken, known as the Gregorian Reform, with the aim of fighting against the moral relaxation of the clergy and also aimed at strengthening the independence of the Church with respect to the secular power. This environment of renovation resulted in an impressive construction policy, which promoted the construction of new buildings and the renovation of other already existing ones. The interest for the Holy Land (Jerusalem, Bethlehem, etc. ), where Jesus Christ had lived, and for centres that possessed the relics of the most prized saints (especially Rome and Santiago de Compostela), led to the development of a series of ways of communication for pilgrimages, which contributed to the internationalisation of the art. The circulation of knowledge led to the arrival in the West of the influence of Byzantine art, both in the form of paintings and sculptures. The crusades, Christian expeditions to free the Holy Land from the Muslims, which began at the end of the 11th century, also favoured the intensification of contacts. The relation with the Islamic world also brought with it a great enrichment in the cultural and artistic fields. The initiative of the constructions was mainly carried out by the counts and church authorities, and the nobility, which they financed mostly through donations. A good example of this are the paintings of the apse from the church of the monastery of Santa Maria del Burgal, in which, in addition to the biblical characters, there is a representation of the promoter and the count’s family: the Countess Llúcia, wife of Count Arnau I of Pallars Sobirà. She appears with an offering attitude, looking respectful, in accordance with the solemn moment of the offering. The monumental portal of Ripoll is another good example of the importance of the promoters. Its extensive sculptural programme can have a sense beyond the strictly religious one to evoke the consecration of the church by the abbot Oliba, in 1032, who was an entrepreneur of major constructing activity that is evident in the importance of Ripoll as a monastic centre of international relevance. The architect or the master builder, along with the workshops or sculptors and painters, worked according to the initiative of the promoter and following a defined programme, by contributing their capacity for carrying out the project and their technical mastery. The artists did their work based on established models, despite the fact that it was also necessary to accept some margins of creativity. Furthermore, it is known that some of them were integrated in the communities. Unlike in more recent times, it is easier to know the names of the promoters and not those of the artists, a situation that wouldn’t change until Gothic art. One of the few whose name we know in Catalonia was the sculptor Arnau Cadell, who represented himself by sculpting a capitol in the cloister of Sant Cugat del Vallès. Later on, well into the 13th century, the Aragon frontal of Gia contains an inscription with the name of the author, Joan, a gesture that must be interpreted as a sign of self-affirmation and pride. Art historians use the term master to designate the author of a work or series of works stylistically related. The nature itself of the works determined that the architects, stone sculptors and mural painters had to travel around, working from one place to another, attending to the commissions they received. But there were also stable workshops, as it is known from the production of enamels that came from Limoges. These studios, workshops and itinerant artistic groups were located close to the most important seats of the dioceses and the major abbeys, which were their main clients. We know almost nothing about the workshops that worked in Catalonia in the Romanesque period. Only, and as a hypothesis, the existence is talked about of a workshop based on stylistic affinities or techniques in various works. In Catalonia there was talk of supposed workshops such as those of Ripoll, the Seu d'Urgell, Vic or Girona. In the Catalan counties, Romanesque art was manifested from the beginning of the 11th century and lasted until well into the 13th century. In the architecture and in the art it appertained to the major European centres, especially those of Italy and the Languedoc, in such a way that the external influences were determinant for the successive transformations. 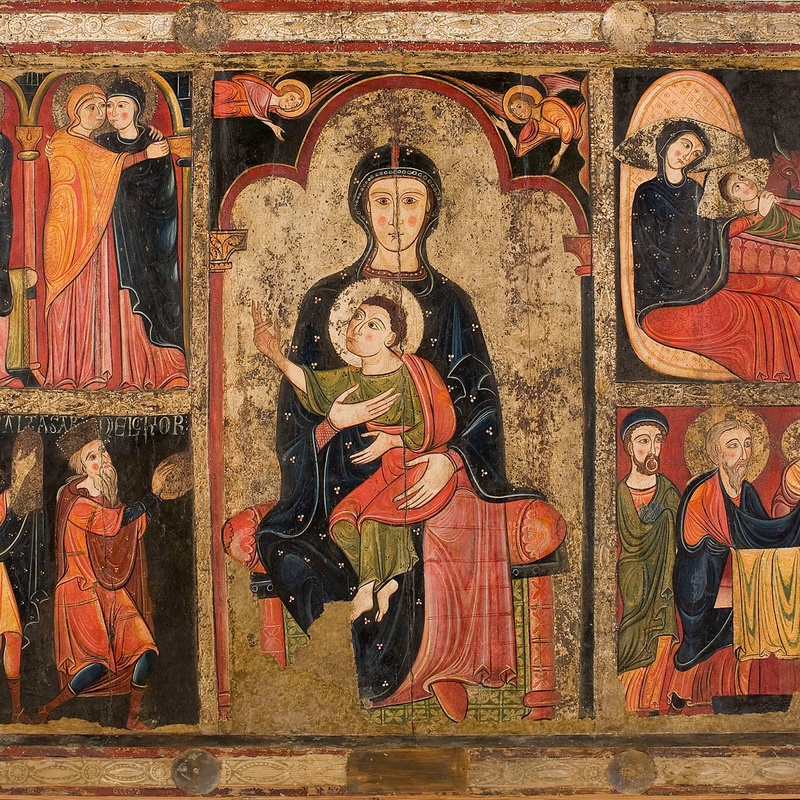 At the beginning, the most important artistic centres reflected the continuity with respect to the 10th century, marked by the Carolingian tradition, as can be seen in the church of the monastery of Sant Pere de Rodes. During most of the 11th century, the architecture presented solutions derived from the end of the ancient world and from Italy, which were also used in much of the western Mediterranean. 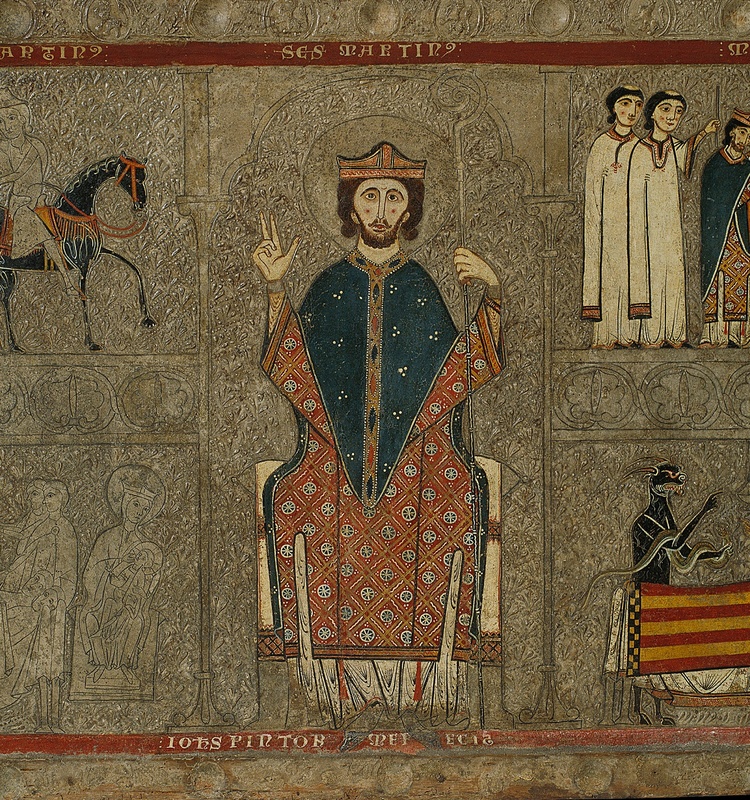 The most important example, among those conserved, is that of Sant Vicenç de Cardona. And one must not forget the illustration of manuscripts such as those of the monastery of Ripoll. The painting, especially around 1100, presented different tendencies, some marked by the Italian influences, and others more closely linked to the French artistic centres. It was in those moments that an extraordinary painter was working in Sant Climent de Taüll, the church consecrated in 1123. The contribution of movements and workshops from abroad would be a constant that would feed the architectural and artistic transformations also between the second half of the 12th century and around 1200. The influences that arrived from Toulouse of Languedoc would be the most significant base of sculpture from the middle of the 12th century. Around 1200, a profound renovation, clearly fostered by the aristocracy and the courts, represented the incorporation in Catalonia of Byzantine tendencies. In some cases, the manifestations reflected the latest trends of the time that would lead to the Gothic, at a later stage. The term Romanesque was adopted in the 19th century for designating some artistic movements that were considered to be indebted to the Roman art from ancient times, especially in terms of architecture. Since then, this word has been applied, but it should be taken into account that the art which was developed in the heart of the middle ages, fundamentally during the 11th and 12th centuries, presented a wide variety of tendencies. In its beginning it was linked with the Carolingian world (from the last decades of the 8th century to the 9th century) and with the Ottonian world (from the middle of the 10th century to the first third of the 13th century), while at the end it coexisted with the first manifestations of Gothic art, which emerged approximately from 1140 onwards. Geographically it makes up a very important part of Europe, especially the south and west, from Scandinavia to the Mediterranean, although it was also introduced in the Holy Land. 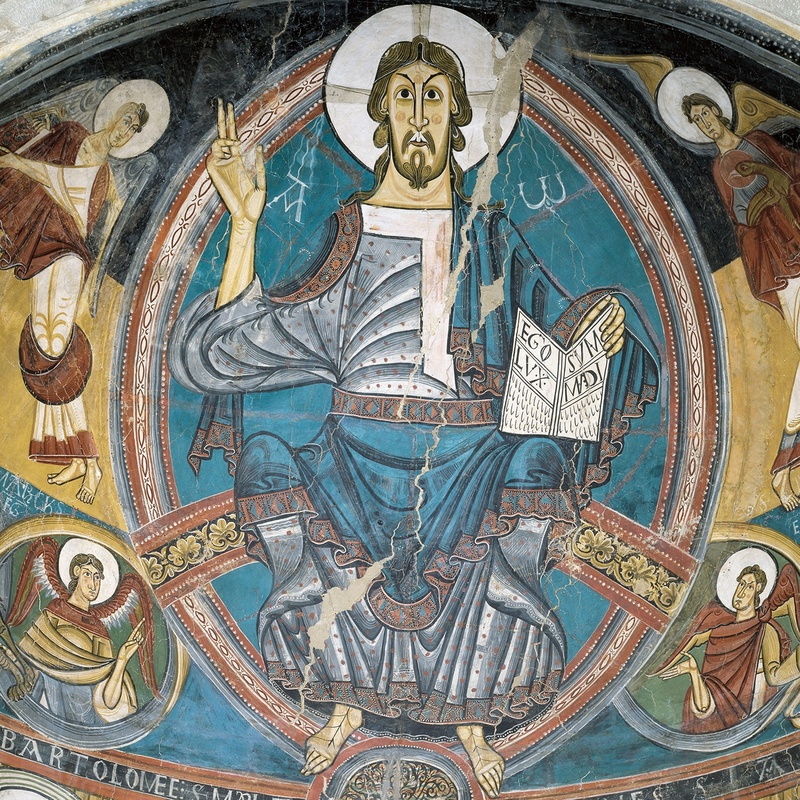 Romanesque is the first western medieval art that was to achieve homogeneity and internationalisation, even though it presented numerous regional variations. Romanesque art is marked by symbolism, in such a way that the episodes and characters should be interpreted according to their symbolic value, more than their narrative. The thematic repertoire is fundamentally based on the Bible and the lives of the saints. The themes selected and their location within the church respond to various aims. First of all, a didactic sense with a view of the faithful, to whom it was necessary to illustrate the essential aspects of the religion: the images are the Bible of the illiterate. Often the themes appear as a warning of the dangers of falling into sin, or as an image of the fight between good and evil. Worship and liturgy also influence the organisation of the themes, in that they are a reflection of the ceremonies and events that can take place inside or outside the churches. In some cases a political sense can also be observed, understood as a reference to demonstration of power or as a reference to the rulers. But behind the most immediate symbolism of the scenes, there are also other levels of interpretation that weren’t always within the reach of the spectators. Some topics are difficult to interpret, or appear in points far from the eye of the spectator. The most important part of the collection of mural painting of the museum was gathered together in an operation carried out between 1919 and 1923. 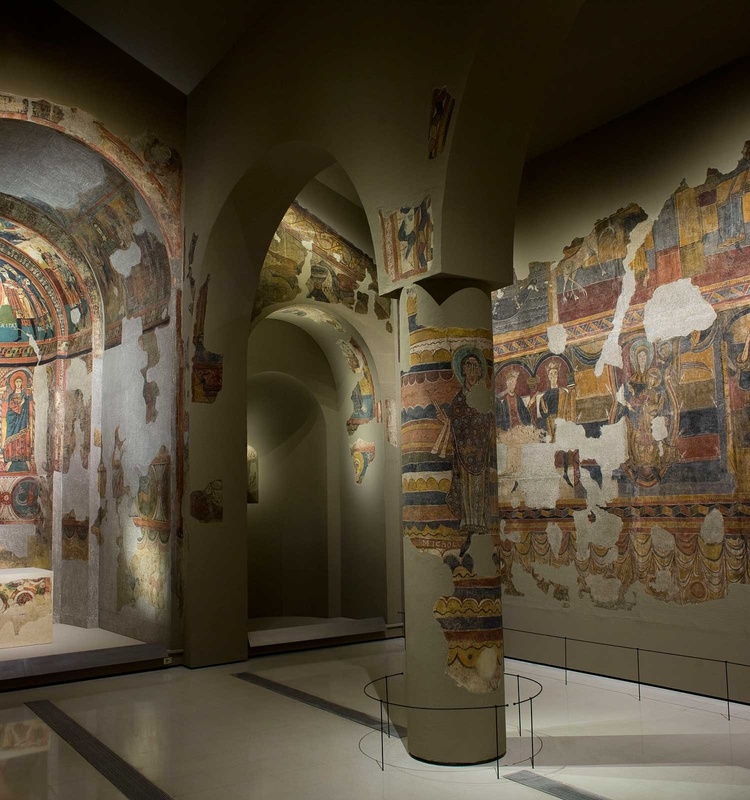 It had been discovered that the Romanesque paintings of the church of Santa Maria de Mur, in the Pallars Jussà, had been sold and removed from the wall. 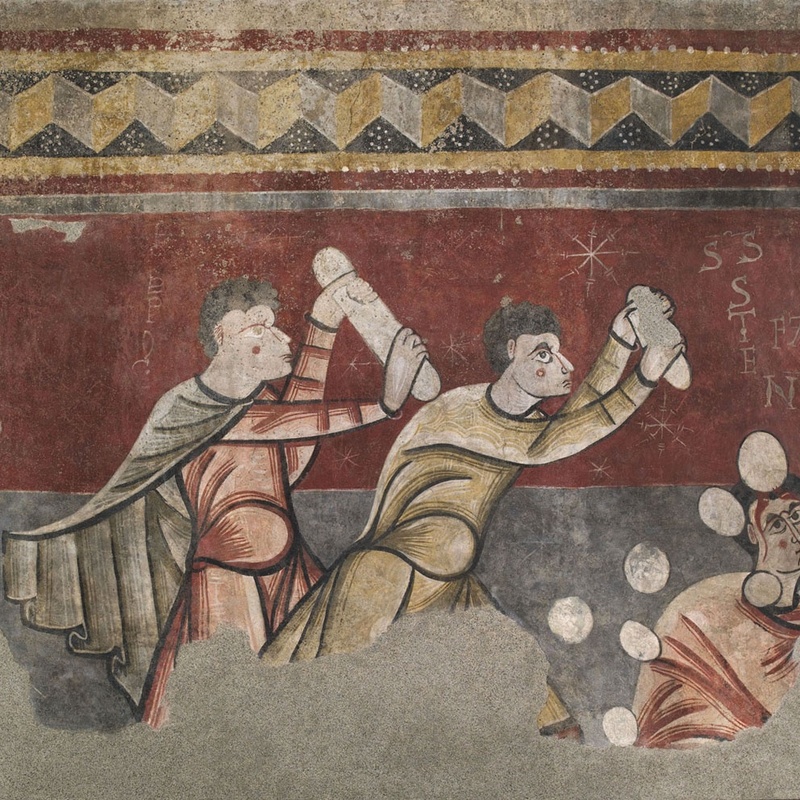 It was therefore considered that the rest of the Catalan Romanesque mural painting was at risk. The decisive action of the Board of Museums and Joaquim Folch i Torres, the director of the museum at that time, turned the situation round. Between the autumn of 1919 and 1923, the paintings were acquired, they were removed from their original support, the walls of the churches, and they were transferred to Barcelona, where they were fixed to another support and made ready to be exhibited in the museum. 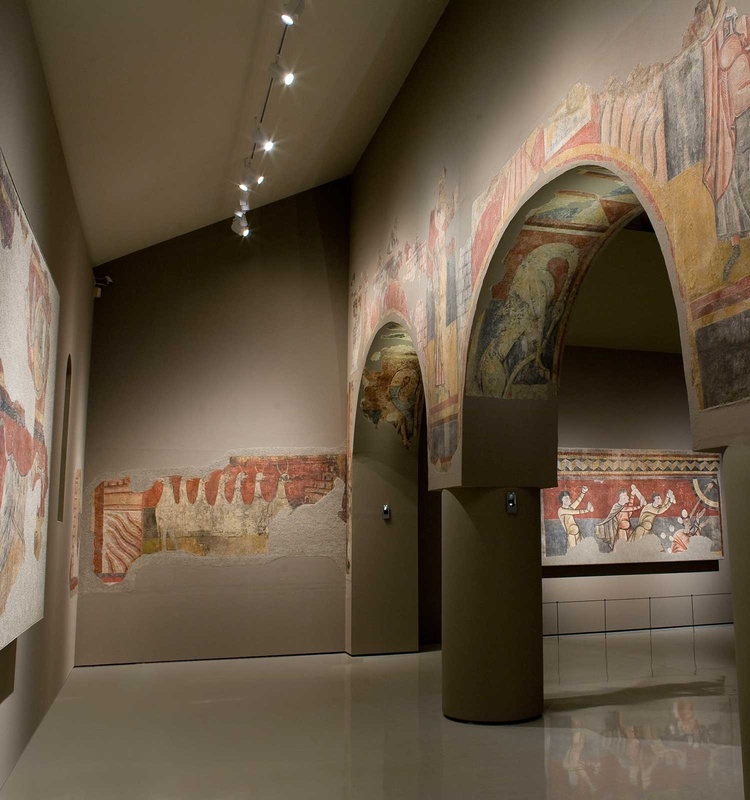 Nearly all the Romanesque mural paintings of the museum were removed from the walls using the Strappo technique, that is to say, only the pictorial layer is extracted, leaving the plaster coating on the original wall. In the technical process of painting on a wall in the open air, the pigments are applied on the wall on a layer of mortar that is still damp. When the mortar dries, the pigments crystallise along with the mortar itself. In Catalonia, the pigments most used in the Romanesque period were natural earths from the Pyrenees: haematites for red or aerinite for blue. In exceptional cases imported ones were used, such as lapis lazuli or azurite for blue.